Our firm has a proven record of delivered results over the past 35 years. We are tenacious in pursuit of clients' rights. The founder of our firm, Barry K. Rothman, has served the legal needs of entertainers and businesses for over three decades, including more than five years as corporate counsel for Warner Bros. Records. Our firm is dedicated to the delivery of exceptional personalized service at an affordable cost. We take all major credit cards. We represent clients in a global way; whatever legal advice and legal and business services clients need, we will provide - and provide well. We do more than just litigate. We negotiate agreements between parties in business and entertainment. We take time to discover what success means to each client and ensure the results are compatible with each client's definition of success. 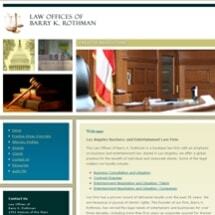 Our firm is capable of giving substantial attention to clients that larger firms may not be able to provide. Our dedication and personal attention to clients and ability to deliver results in a host of complex matters are the foundations of our firm's success. We are available whenever required.